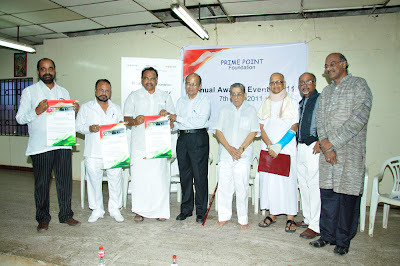 Prime Point Foundation, Chennai and Corporate ezine PreSense honour the top performing MPs of Lok Sabha since 2009. Top 5 MPs of 14th Lok Sabha were featured in the ezine PreSense. In 2010, the Foundation instituted Annual Awards for the top performing MPs (calculated till the end of 31st March of every year based on the data provided by Lok Sabha Secretariat and compiled by PRS India. Mr Hansraj Gangaram Ahir (BJP MP from Chandrapur, Maharashtra) and Mr S S Ramasubbu (Cong MP from Tirunelveli) were honoured for their top performance in the 15th Lok Sabha till the end of March 2010. Mr Ramasubbu, stood first in debates, private bills and questions in Tamilnadu. For the year 2011, a simple and impressive function was organised at Thakkar Bapa Vidyalaya on 7th May 2011. Mr Era Sezhian (well known veteran octogenarian Parliamentarian), Mr N Vittal (Former Central Vigilance Commissioner of India) and Mr Sthanunathan (Secretary of Thakkar Bapa Vidyalaya and a Gandhian) were the chief guests. During this function, Mr Hansraj Gangaram Ahir (BJP MP from Chandrapur, Maharashtra), Mr Anandrao Adsul (Shiv Sena MP from Amravati, Maharastra) and Mr S S Ramasubbu (Cong MP from Tirnelveli, Tamilnadu) were honoured for their top performance in the Lok Sabha till the end of Budget Session 2011. Mr Hansraj stood first for overall tally and also in introducing Private Member Bills. Mr Adsul stood second in the overall tally and also first in raising questions. It may be noted, Mr Adsul stood first in raising questions even in 14th Lok Sabha. Mr Ramasubbu, stood fourth in the overall tally at national level and first among Tamilnadu MPs. A round table discussion was held on the theme "Social leadership and development politics". There was a huge particpation of youth in this programme. Besides the award winning MPs, Dr Jayaprakash Narayan MLA of AP (President of Lok Satta Party), Mr Vivek Pandit Independent MLA from Maharashtra, Ms Jothi Mani, General Secretary of Youth Congress also participated and shared their views. At the request of K. Srinivasan, Prime Point Foundation, the award winning 3 MPs agreed to take student interns to train them in parliamentary proceedings and procedures. Department of Humanities and Social Science of IIT, Chennai has agreed to nominate students to these top performing MPs. Based on the experience, this concept will be extended to other willing MPs. This is the first of its kind in India. Besides the three top performing MPs, the Foundation has also honoured Manam Malarattum, Build Future India, the NGOs and serial inventor Mr Arvind Thyagarajan (30) who holds 40 patents in his name. Mr Sudhangan, a well known TV anchor, moderated the discussion. Indian Overseas Bank, Chennai Petroleum Corporation Ltd, Good Relations, Karnataka Power Corporation sponsored this event. Cyber Society of India, India Vision online group and Action 2020 Team supported this initiative.